Your diamond jewelry will need occasional care and attention. Store your diamond separately in its own box because if jumbled together, diamonds can scratch each other, as well as other gems and jewelry. Diamonds can get dirty, because they may attract grease and oil. 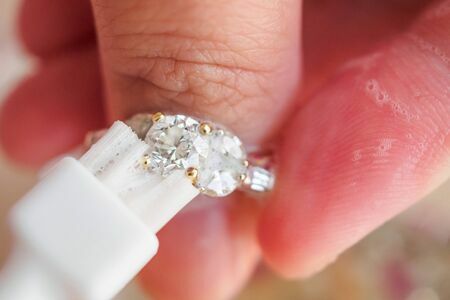 Occasional cleaning removes this residue, and helps to bring out a diamond's brilliance. To clean your diamond jewelry, first immerse it in a pan of warm soapy water. Then, gently brush it with a soft brush. Finally, rinse it well under warm running water, and then pat it dry with a soft cloth. Care for your diamond, and it will always sparkle. It is a good idea to take your diamond jewelry to your jeweler every six months. The jeweler will inspect it to make sure that the prongs are still tight, and are holding the diamond securely in the setting.